December 9th has brought another little kit, the Snow Queen Wristlets. I don't know if I'll ever make them (the queue is so long), but if not, the yarn will go into my stash and used for another project. The yarn is beautiful. 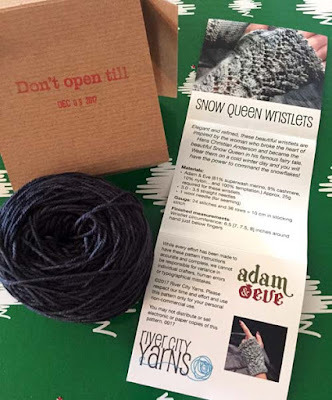 It's River City Yarns' house brand - about 25 grams of Adam & Eve: 81% superwash merino, 9% cashmere and 10% nylon. I've used Adam & Eve before and it's wonderful - highly recommended.